Congress politics takes another beating! Rahul Gandhi extends his leave of absence from duty! 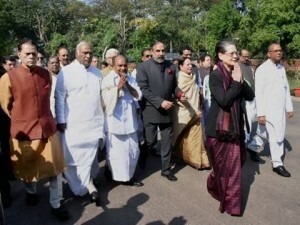 Sonia Gandhi plays her role as a party president! So, all amount to what end? Indian polity is taking some curious turns lately. Of course, Mr.Narendra Modi, the Prime Minister, is showing some change of behaviour. He seems to have toned down his swagger a bit. As a new comer to the national scene Mr.Modi showed all the hurry about his new role. He was here and there and everywhere and he suddenly emerged as a world statesman. He almost in a stroke seemed to have outdone his famed predecessors. Pandit Nehru and Indira Gandhi seemed to take a backseat. Such was Mr.Modi’s displays. After all these high profile performances lately, the PM seemed to have become a bit modest. Of course, there are many reasons. The one big factor is the Delhi Assembly elections that saw Modi wave disappear. So, he must have become a bit wiser and modest. That can only do good for the PM and the country. Now, why the PM didn’t choose to travel to the UK where he was supposed to have participated in the unveiling of the Mahatma’s statue? For those who are familiar with the UK and its politics, its media and much else, some of the more vocal rights groups like Green Peace and Amnesty International, these groups might have embarrassed the PM and the British media too is so unpredictable that Mr.Modi might have felt greatly concerned. So too the UK-based dispora, specially the UK-based Gujarati community which, in Modi’s calculations, might not have obliged his expectations of an unalloyed united display of support for his persona and his policies, of the past and the present. The British are a shrewd people and their establishment is known for its tricks and trippings! Anyway, the Intelligence might have also given the Pm its feedback. Now, this is only one sideshow. There is the current plight of the Congress which too after it finds itself in a peculiar crisis; we can say it is an in-house product! Rahul Gandhi is playing truant and he is not willing to play ball. A fond mother only wants to her only son to inherit whatever is left. For the Gandhi family, all that is left is a truncated Congress party. But then the legacy is great and whatever is left itself is worth the trouble. There is of course the future prospect of power. Also, there are the leftover perks, again, whatever there are. So, Mr.Gandhi, his mother must have calculated, it is still worth the sweat and tears to inherit the comforts and security that goes with a Nehru-Gandhi scion. So, reduced to the last shreds of whatever power and prestige is there, it is worth striving for. Now, the latest trouble is Manmohan’s prospect of facing criminal trial court’s un predictable delays. Surely, Dr.Singh, unexpectedly, brought to his job this albatross around the Congress neck. Now, the question or questions for the Congress party are many and too complicated. There are, as for old and long-standing Congressmen like the present writer, so many dialemmas, both moral and political issues. The Congress party under Sonia Gandhi, at least, in the last ten years when Dr.Singh was the Prime Minister, had undergone much transformation. One big such change is the utter amorality of running the party and taking decisions at the party and in the government. Dr.Singh became PM in 2004, as we all knew, by a process that was not proper. And in 2009, it is widely portrayed, as many things in the Congress party are portrayed to serve someone else’s ulterior ends. The Congress party, as a political party, gave up all pretences to any morality in its behaviour. To cut the story short, Sonia Gandhi’s many pretences, her sacrifice in enouncing power etc were exposed one by one by her own one-time inner coterie. Even the civil servants like D.N.Pradhan, Sanjay Baru, why the one-time chamcha, Natwar Singh and others have exposed the dormant ambition that was lying inside of Sonia had been steadily stoked by many forces and ultimately, when she was about to launch her son, Rahul Gandhi, in the 2014 Lok Sabha elections, somehow things wrong. She became so ambitious for personal power that during the 2014 elections even the Congressmen who were supposed to be closer to her were seen left out and only Rahul alone focused as his flexi posters showed, they were displayed in such sudden manner all over the country from Kashmir to Kanyakumari, may be that very over-display also might have contributed to a reaction! Anyway, the one-time war-room boys were seen nowhere, there were no big names or big faces, all the senior cabinet ministers were seen wearing their black coats and see at the Supreme Court premises! What a betrayal! What a display of revenge? How else you can describe the total disintegration of the party structure on the eve of such an election? Where was Dr.Singh? Then, even after that rout in the Delhi Assembly elections? Now, as for the plight of Dr.Singh there are several issues. One, sympathetic for the plight of a man who is known for his simplicity etc. (Dr.Singh was my contemporary at Oxford in the late 1950s). As for the former PM, there are also certain other issues. He chose to enter politics just for the sake of the office. His contribution to the growth of the party is zero, right? He never for once ever wrote a piece as to the party’s ideology or vision, right? Also, for a learned man like him, he should have shown great sensitivity to moral scruples; he coolly went to Assam and declared on affidavit that he was ‘habitual resident of Assam! How the moral scruples of such a sensitive person allowed him to do this sort of thing? Also, there are such gross misuse of principles and conduct as a Congressman. Fine. When did Dr.Manmohan Singh become a Congressman? What was he before his entry into active politics/Party politics? All these questions, of course they are comfortable for those who have lately entered the Congress party under Sonia Gandhi. She had admitted all sorts of persons, plain defectors from rival parties, turncoats, of course every description of persons, bureaucrats and all those who made Delhi their homes, lawyers and other busybodies who come to politics just for grabbing power and real estate. If readers only care to remember and recall just after the rout of the Congress party became clear Dr.Singh in his capacity as the Pm rushed to allot a lot of bungalows and other comforts to some 50 or 60 we recall and in such hurry! Is this all justified for a person in his position? What sort of a legacy and a lesson Dr.Singh wanted to pass on to his countrymen as the Prime Minister of India? Even now, after his retirement to a cost 3.5 acre bungalow in prime Delhi locality and with so many other irregularities the Congress party itself had lived all these years, what sort of legacy the party, its president, the Prime Minister have left behind? We can go on and on but we have to limit here to one or two critical issues. As for the legal tangle in which Dr.Singh finds himself, Mr.R.K.Raghavan, the former CBI Director had written perhaps the most candid article on the case (The Hindu, March 13, 2015). There is no immunity from prosecution from criminal prosecution. There are already previous examples, for instance, the case of P.V.Narasimha Rao and others. There is in our view, the much more moral and political side of the Dr.Singh’s Prime Minister era. Indians, especially those who had lived through the British era and also in the post-independent years, Delhi power structure, including the bureaucracy, political parties and the attendant rich and the powerful elite, army and other middlemen and brokers, of course the corporate who control the resources, those contribute funds to the parties, those who control the media, both print and the TV channels, these new sources and forces make up a heady crowd. So, any questions about morality or ethics in Indian public would be laughed at! Hence we see the high hypocrisy and the faces of pretences! Indian famed mindset, servility, cowardice, sheer cynicism and amorality for the sake of power and pelf and utter selfishness and a brazen disregard for the truth and why, even the Indian sense of karma are all become irrelevant in the short term. As a Congressman of long-standing I am committed to traditional Congress values. The organisation can’t become anyone’s private property or private domain. Democratic norms, secualirsm and an equitable society and economy would be the cardinal principles. Only the Centre-Left-Liberal Congress party would win over people and save the country. Jai Hind!